This is the official web site for the Cross Linking-Mass Spectrometry Analysis Tools StavroX (2) and MeroX (1). Both software solutions can be used to identify cross links of peptides in complex mixtures. StavroX identifies all kinds of cross linked peptides (with DSS, BS³, Disulfides, zero-length...), while MeroX identifies cross links of cleavable cross linkers (CID-cleavable). You can Download both programs from this site. If you have got questions concerning one of both programs please visit the help section. MeroX is very similar to StavroX in that it identifies cross linked peptides. But MeroX is specialized for MS/MS-cleavable cross linking reagents (1)(3). MeroX identifies the specific fragmentation products of the cleavable cross links. This improves the reliability and simplifies the analysis enormously. Scoring modified: XL-Score includes Peptidescores, final score includes prescore and delta score. Decoys are generated at the peptide level instead of protein level. only spectra with more than 25 signals are used for searching. Consecutive Sequences excluded also for isoforms!! 05.11.2017 - Major Update of StavroX und MeroX! FDR-calculation adjusted to mixed decoys. 27.10.2017 - MeroX-Workshop at the 7th Symposium for Structural Proteomics 2017 in Vienna (SSP 2017) The new MeroX version was presented in the Cross-Linking-workshop organized by the COST action BM1403. The workshop material, including the presented beta versions of StavroX and MeroX can be downloaded here. The final release will be in November 2017 as the new functions still need to be thoroughly tested. 02.04.2016 - Major Update of StavroX und MeroX! MeroX-Presentation at HUPO 2015 - Poster Presentation of StavroX and MeroX at the HUPO World Congress in Vancouver, Canada September 27-30. 18.09.2015 - Major Update of StavroX und MeroX! Decoy	analysis and FDR calculation might be corrupted in older versions! All analyses are correct. The decoy analysis was not loaded completely for display. Therefore FDR values might have been lower than actually determined! Already analyzed datasets can be	opened with this new version and decoy analysis will be shown correctly! 14.12.2014 - Update of StavroX and MeroX. 08.08.2014 - Update of StavroX and MeroX. new result file format applicable to large datasets (*.zhrs and *.zhrm). 11.06.2014 - Update of StavroX and MeroX. new result file format applicable to large datasets (*.hrs and *.hrm). old result files cannot be loaded anymore. Either perform the search again or use a previous version. 01.04.2014 - Bug fix in MeroX! Issues with high precision MS/MS-data and multiple neutral losses solved. 15.03.2014 - Bug fix in MeroX! Issue with detail window solved. 03.03.2014 - Bug fix in MeroX! Issues with charge states of cross linker fagment additions solved. 21.01.2014 - New Version of the cross linking software packages StavroX (3.2.0) and MeroX (1.3.0) are available. The update includes a faster identification of cross link candidates and faster scoring. Scoring can be turned off or score quality can be increased. StavroX obtained a new scoring algorithm. 18.11.2013 - MeroX 1.2.9 is now available! MeroX identifies cross links specifically with MS-cleavable Cross linkers. New Version of StavroX 3.1.19 adds *.mzML support. Mass search possible on all tables with Da, ppm or % precision. compatibility to *.mzXML and *.pkl file formats added. Cancel button to abort calculation. 25.10.2013 - New Version 3.1.17 adds better perfomance to zooming in spectra (rectangle drawn while dragging) and an automatic and manual update check. 18.10.2013 - Bug fix of problem with Settings file (duplication of lines), that was introduced with version 3.1.15. It is now possible to run StavroX without calculating a score. 11.09.2013 - Minor changes to the score, the standard settings file and the Settings window have been implemented in version 3.1.15. The standard settings file that is created on the first start was changed, as the EDC cross linker changes the mass by -H2O and not zero. 30.08.2013 - StavroX 3 is published online. The new version can be downloaded from the download page. What is new in StavroX 3 ? New Language: StavroX 3 was developed in Java from scratch. It´s function is similar to that of previous versions (1). Much faster: StavroX 3 runs more efficiently than previous versions. It uses Multi-threading to split the time consuming scoring of cross linking candidates to all availble processors. StavroX 3 can handle more complex calculations than before like more proteins or more complex modifications. New Score: StavroX 3 uses a revised algorithm to calculate the score of a cross linking candidate. The new algorith is based on the probability of an ion to occure and the intensity of the signal in the fragment spectrum. New Fragmentation representation: On the right you see the new fragmentation representation of a cross link. It shows the identified fragment ions with their respective positions in the peptide as well as the charge. The intensity of the identified ion is color-coded. This makes it easy to identify ion series as well as the identity of high intense signals. New GUI: The Graphical User Interface (GUI) has changed to present data in a more efficient way. 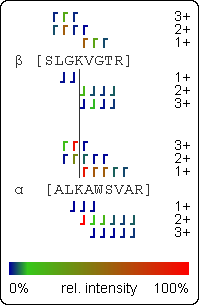 For example: The labeled spectrum is shown once a precursor is selected. More Settings: It is now possible to search for a, b, c, x, y and z-ions. Neutral losses of fragment ions can be specified. Filter & Search: Handling of big datasets is simplified by a number of filter and search options. new File Formats Results of analyses are stored in a more efficient way and take up less space on the hard drive. (1) Götze et al. Automated Assignment of MS/MS Cleavable Cross-Links in Protein 3D-Structure Analysis. J Am Soc Mass Spectrom. 2014 Sep; ePub ahead of print. (2) Götze et al. StavroX--a software for analyzing crosslinked products in protein interaction studies. J Am Soc Mass Spectrom. 2012 Jan;23(1):76-87. (4) Grimm et al. xVis: a web server for the schematic visualization and interpretation of crosslink-derived spatial restraints. Nucleic Acid Res. 2015 Jul;43(W1):W362-9. Logos and Images on this website are copyighted. Logodesign by Rebekka Balogh. Webdesign by Michael Götze. You cannot use these logos or images without permission (go to help section and use the contact developer form).